﻿ E-ink-Reader. APPLICATIONS FOR READING, CONVERTINGS OF FORMATS, CREATIONS OF THE COLLECTION OF BOOKS ON THE COMPUTER. Official site of the program. All these programs is freeware, they have the convenient interface. Thanks to possibility of selection of text colour and a background, change size it is possible to create a mode of reading optimum for eyes. The majority of programs shows on the screen at once two pages of the book with the background image simulating the open paper book. If the e-book reader whom you have got does not support reading of files of a format FB2 , there is a necessity of transformation of this format to another format, supported by your device. For Sony Reader, the program-converter from FB2 in EPUB , and for Amazon Kindle - from FB2 MOBI is for example necessary. FB2 to Any и FB2 to Any Convert from FB2 to txt, rtf, rb и lit and back. Unfortunately, to convert graphic files (DJVu and most part of documents PDF) in FB2, MOBI, EPUB by means of one program is impossible. If have to yourselves such problem, it is necessary to recognizing text (by means of programs OSR), manually to correct errors and only after that to create FB2, EPUB, MOBI - a file in the editor. To convert text formats EPUB - FB2 - MOBI (PRC) each other it is possible also the program - librarian Calibre, described more low. Fiction Book Editor - Perhaps, the most powerful program for creation and editing of files FB2. The program have the text mode for direct editing of the book, an insert of headings, images, a mode of a code browse and an editing mode of information heading of a file. Sigl- The visual editor of books of format EPUB. Allows to editing the EPUB-book, using only a mouse (allocating, copying, moving text fragments) and without going into details code XML. The program interface only the English-speaking. Calibre- Powerful enough program for creation of home library. Allows to spread out books on regiments, authors, to show one point duplicates of e-books of different formats, has built in the converter of formats and the browser of files of e-books. Search engine Book Library - the program for downloading and storage of e-books in home library. TinyOPDS - OPDS server. The term "OPDS-directories" is discussed in the "Libraries" .This is a program for creating home OPDS-catalog. It scans files of books in a specific folder and disk distributes them by genre / author / novelties. It’s very convenient to download books to mobile devices and e-readers with support for Wi-Fi, running the program TinyOPDS on your desktop, connected to wi-fi router. The program - the proofreader of the text. If you copy the text from Internet page in a notebook for the purpose of its further viewing on the electronic book at it often there are superfluous ruptures of lines, blanks and carrying over symbols. The program for text reading of the e-book reader at an abundance in the text of such "garbage" quite often starts to accept separate words within the offer for headings of heads, place them in the page centre. Happens even on each page are located all on two - four words by a bold type. 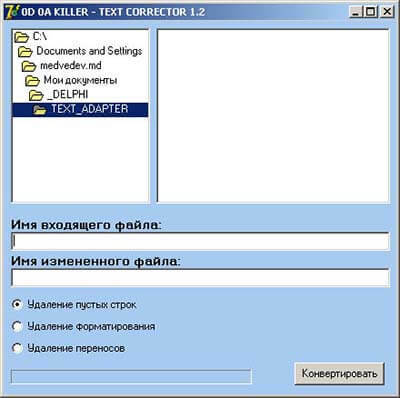 To clean such "garbage" from the text the program-proof-reader allows easy to in use. Proofreader of the text download.